It's been almost 25 years since the Lesbian Avengers first took to the streets, and the very first Dyke Marches were held. 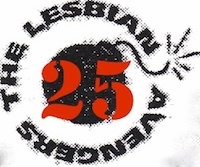 Now, activist dykes all over the world are planning to celebrate 25 years of lesbian activism and Dykes Marches. This newsletter will keep you in the loop about planning and events as we organize exhibits, parties, film screenings, and more in a multitude of cities. It will also tell you how you can get involved. The goal? To preserve Avenger stories and encourage new activists to go forth and wreak havoc for the sake of dyke lives! Subscribe to Avengers25 by filling out the following form. You will be sent email requesting confirmation, to prevent others from gratuitously subscribing you. This is a hidden list, which means that the list of members is available only to the list administrator.